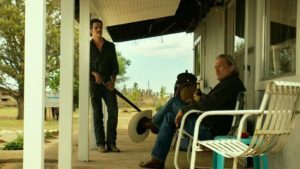 The first of many startling images in director David Mackenzie’s neo-Western, Hell or High Water (2016) is of three crosses embedded in tile into an adobe building. We see the Christian icons in the background of the image, through the drive-through lanes as a teller opens her branch of the West Midlands Bank in rural Texas. Two brothers, Tanner and Toby Howard (Chris Pine and Ben Foster) are about to rob the bank so that they can pay off the reverse mortgage that is about to result in the foreclosure on their ancestral ranching lands. The crosses provide a potent visual pun: the film begins with the image of Calvary, the location outside Jerusalem where Jesus was crucified alongside two thieves. Jesus is nowhere to be found in Hell or High Water, but the film builds our sympathies for the two thieves, enacting a plan to bequeath the land not to the greedy bank but instead to Toby’s two sons. What Westerns are supposed to be about is the cavalry, soldiers mounted on horseback. Indeed, this linguistic reversal of just one letter allows us to consider the beautiful historical project of Hell or High Water, the inversion of the imperialist logic of the Hollywood Western. Mackenzie’s film, based on a sparkling script by Taylor Sheridan, reverses the assumptions of John Ford’s The Searchers (1956). In that film, a homesteader family is murdered by a Commanche chief, Scar. The only one spared is a child, Debbie, whom Scar kidnaps and then marries when she comes of age. The homesteader’s relatives, led by Ethan Edwards (John Wayne) and Martin Pawley (Jeffrey Hunter) spend the entire film hunting down Scar to rescue Debbie. With the aid of the cavalry, they do so in the last minutes of the film. In the famous last shot, Ethan delivers Debbie to the new homesteaders, who proceed to kick the door shut on Ethan, whose brutality is necessary to reunite the family but unacceptable to the civilization which will to flourish in the aftermath. The script for Hell or High Water re-positions the pieces from The Searchers to tell a different story, one about 21st century West Texas. It is a story of what happens after civilization has run its course. The threat of Indian raids on the white settlers’ stolen land is replaced by banks foreclosing on their destitute progeny. Hell or High Water splits the character of Ethan Edwards into two figures. On the one hand, Marcus Hamilton (Jeff Bridges) fulfills the role of Ethan Edwards. He is a racist, ornery Texas Ranger who relentlessly pursues the brothers. As Ethan kills Scar, so too does Marcus shoot one of the brothers, Tanner in the head. Marcus incessantly torments his partner Alberto with his so-called half-breed nature (he is part Mexican and part Native American), in a replication of The Searchers, a film in which Ethan refuses to admit Martin Pawley as his kin because his nephew is part Indian. However, Marcus is not the only Ethan Edwards figure in Hell or High Water. Just as dogged is Toby Howard, who spends the entire film robbing banks to bequeath his family’s land to his two sons. At the film’s end, his connection to The Searchers is fully illuminated. Marcus comes to visit Toby, who has gotten away with the robberies, bought back his family’s land, and spearheaded an oil deal which allows his ex-wife and sons to earn $50,000 a month on the proceeds of the drilling. Marcus refuses to let the case go, even though he is now retired. As Marcus and Toby confront each other on the porch of the ranch house (meeting for the first time), Toby’s ex-wife arrives home with the boys. Toby’s ex-wife is named Debbie, the allegorical key to Hell or High Water’s redemption of the classical Hollywood Western. Unlike Ethan, Toby has not had to kill a Native American chief to return his Debbie to the homestead. Instead, Toby has protected her from the rapacious bankers, and delivered a now solvent homestead to her. Where The Searchers brings Debbie back to the homestead, in Hell or High Water, Toby returns the homestead to Debbie. Like Ethan, Toby ends his film on his ranch’s front porch, having committed brutal crimes to reunite his family. Yet neither hero revels in the fruits of their labor. No cavalry rides to the rescue at the end of Hell or High Water. Instead, the brothers Toby and Tanner sacrifice themselves, one in body and the other in spirit, more akin to the story of the Calvary with which the film began. For his part, Marcus also suffers Ethan’s banishment. As the camera pans right across the oil derricks into the bleak West Texas landscape, we watch the failed lawman drive away into nothingness. Just as with Ethan’s banishment into the dust of Monument Valley as the door of civilization slams shut on him, Marcus drives alone into a future that has no use for him, a tough-guy Texas Ranger in an era when banks do the thieving and not even the Federal government can stop them. The civilized shroud of the law protects the bankers, but not the people who have toiled in sweat and tears to build the society around them.